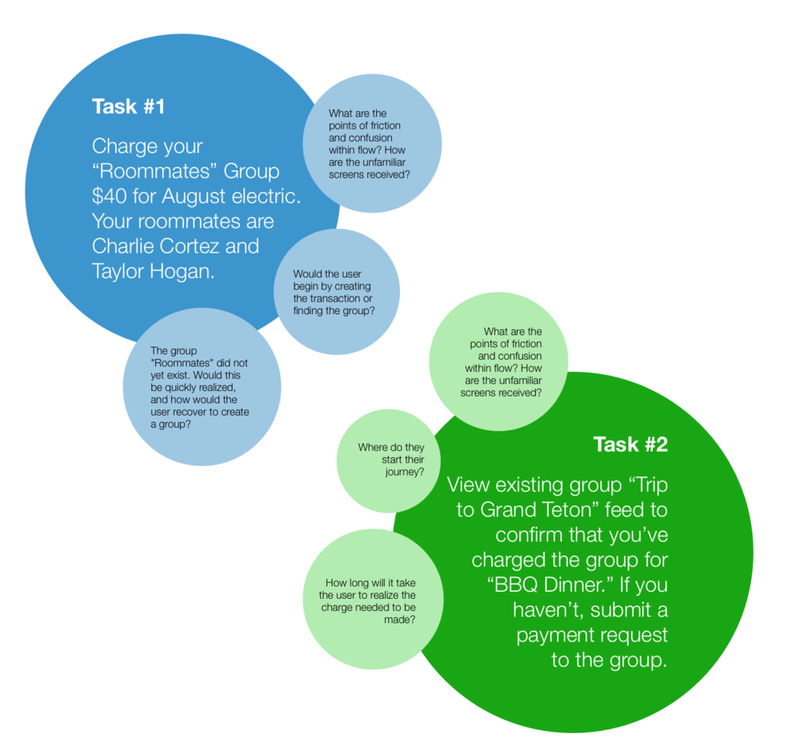 TL;DR (Summary): I designed a new feature for the Venmo app, called Venmo "Groups" which allows users to create groups with other users - like roommates, travel companions, and good friends - to easily manage and track transactions associated with an event or context. Research revealed most users leverage Venmo for many-to-many transactions (ie multiple users sharing multiple transactions for a specific reason, such as roommates who are splitting living expenses) but that the current UI of Venmo is limited in its ability to help users easily track, confirm and manage these shared expenses. While staying true to Venmo's ultimate value-add of "making and sharing payments" and its noninvasive and casual approach, I developed a feature that integrates with the overall app experience and allows these power users to manage complicated payment scenarios without the stress and awkwardness. 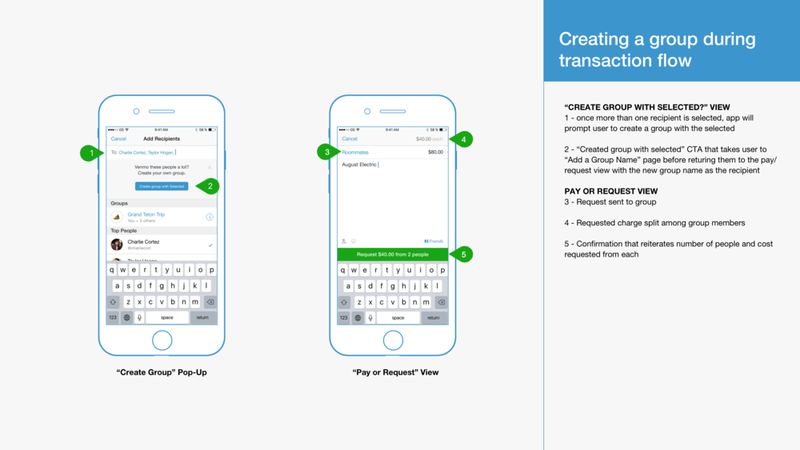 Investigate a new feature/functionality within the existing Venmo app interface that improves the many-to-many experience for multiple users sharing multiple transactions. Final Hi-Fidelity Prototype of Feature. Try creating a new Group with your roommates! Then try charging an existing Group. 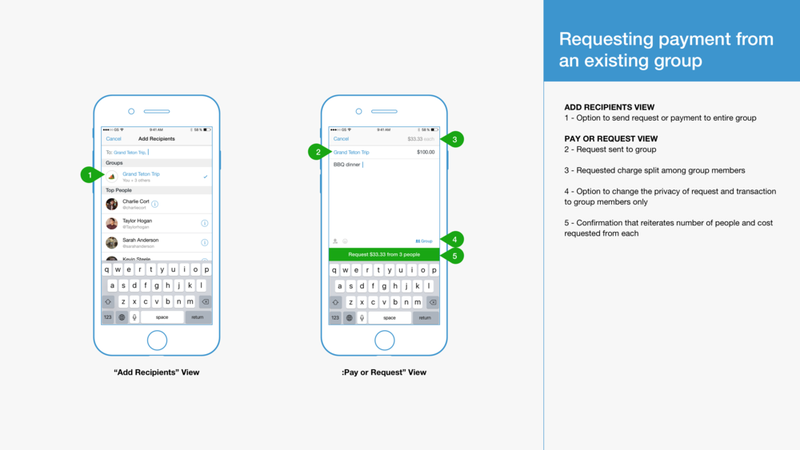 What is Venmo and why is it important? Venmo is a peer-to-peer (P2P) social transaction app owned by Paypal that has revolutionized the way people transact, allowing users to pay one another safely and easily through their app. It's a user-focused product whose value add has been validated ten-fold in its rapid growth. In 2016 alone, Venmo handled 17.6 billion dollars in transactions in 2016 and handled $6.8 billion in transactions in Q1 of 2017 alone, more than double its volume from the previous year. After some early research and inspired by my own experience with the app, I decided to center on improving the app experience for those leveraging it for many-to-many transaction use cases. I had a hunch that people were using Venmo in more complex scenarios than just a single person paying another, having suffered through enough group outings and trips where managing payments across many people was a guaranteed nightmare. 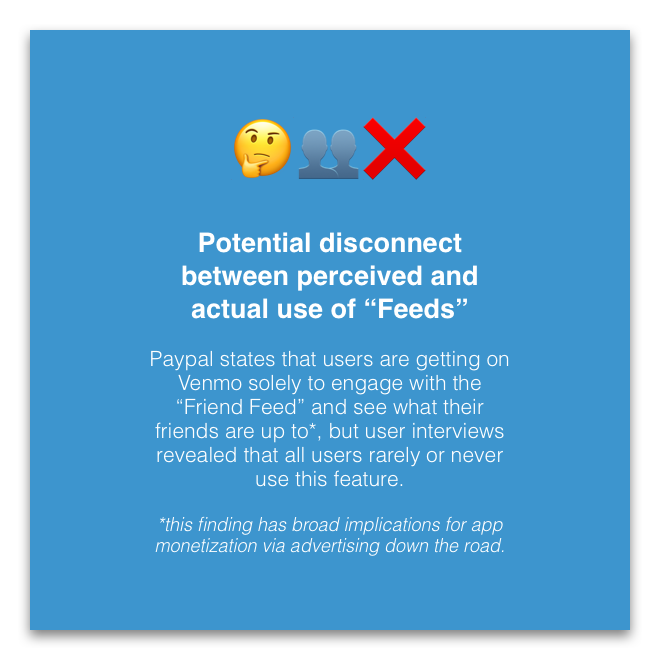 For the discovery phase, I concentrated the bulk of my research on user interviews and competitive analysis to better understand the user’s current Venmo behavior and the context/situational use that surrounds it. 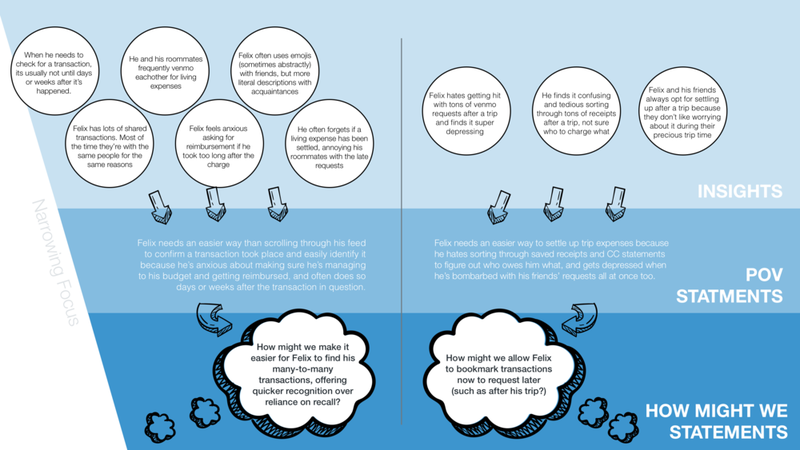 It was important to understand not only the singular user’s habits, behaviors, and motivations, but the way these elements influence, change, or adapt depending on the other users that they’re engaging with via their payments/requests. I sought out users that aligned to my proto-persona for interviews. I took a look at existing competitors of Venmo, both broadly and those that may pose a specific threat to the success of this feature. Observational research took place by watching users interact with the app and getting their general feedback about its current functions and the role they serve in their current use of the product. Recognizing the similarities in the context and use cases, I rearranged my post-its into an affinity map, creating different grouping to reveal two distinct use cases for many-to-many transactions and the general motivations, feelings, and behaviors therein. 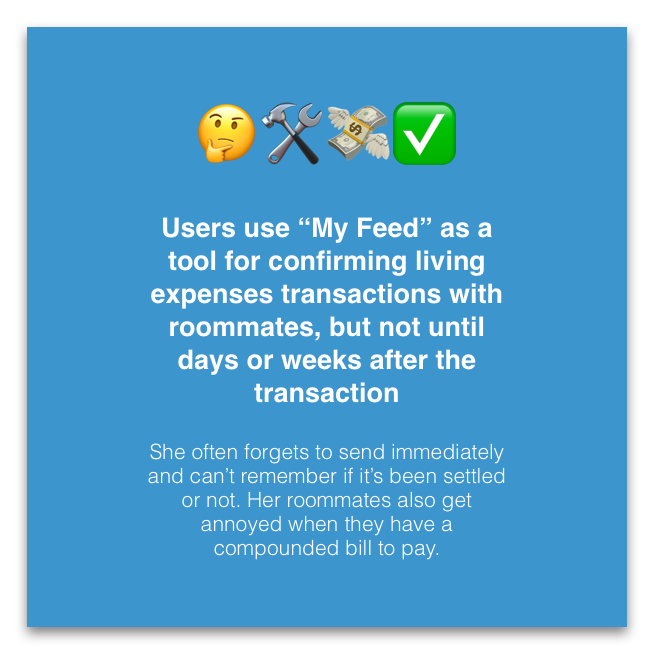 From this exercise, I extracted 6 points of tension, or insights, to help inform my persona's motivations, needs, and idiosyncrasies as they related to their many-to-many usage of Venmo. 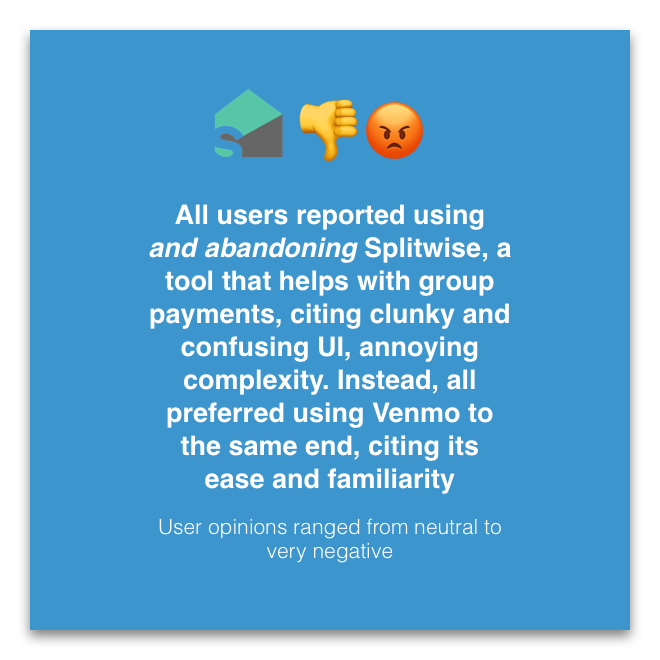 Most insights centered around contradictions in behavior and feelings , such as the user's preference for settling up [expenses] after a trip using Venmo, even though it caused them great annoyance and displeasure; or their negative feelings towards Splitwise, a Venmo competitor built for settling up many-to-many transactions that should, in theory, be better suited for these scenarios. For maximum impact, I needed to consider the goals of Venmo alongside my user's needs. Their goals strongly center around monetizing the app, so the solution offered would need to align, or at the very least, not deter from this goal. In lieu of having an opportunity to talk directly with the Venmo team, I relied on their brand mission and positioning to offer perspective into the company's values and raison d'etre. 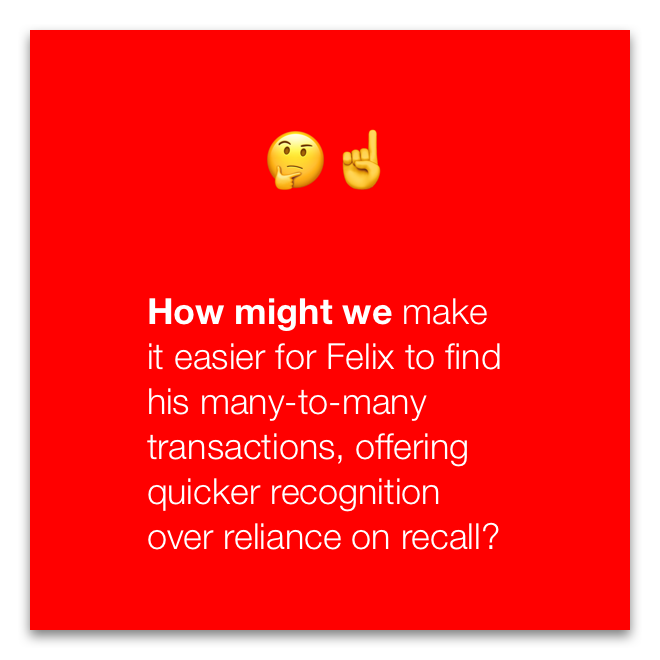 It meant prioritizing some of Felix’s needs over others for the sake of brand continuity and ensuring solutions aligned with the company’s self-identified values about its product. Following the exercise of aligning business and user goals, I revisited the insights that satisfied both. 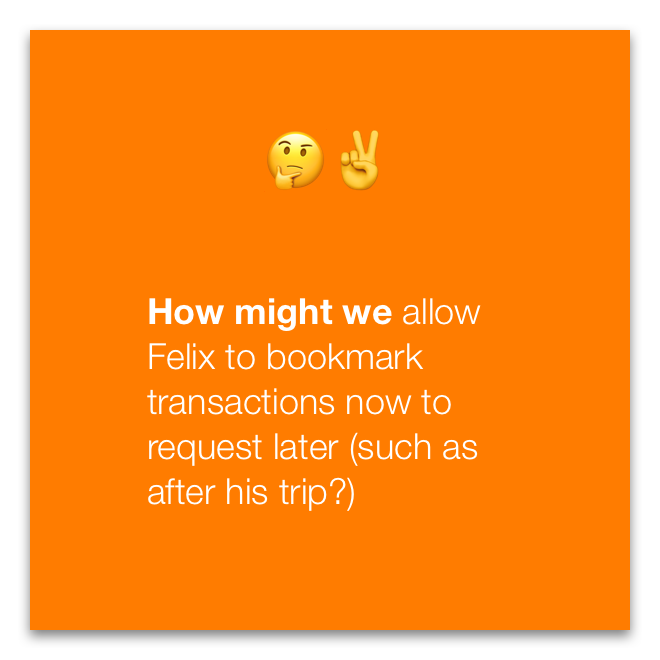 From there, 2 POV statements were developed that directly corresponded to Felix's 2 main many-to-many use cases: sharing living expenses and sharing trip/travel expenses. 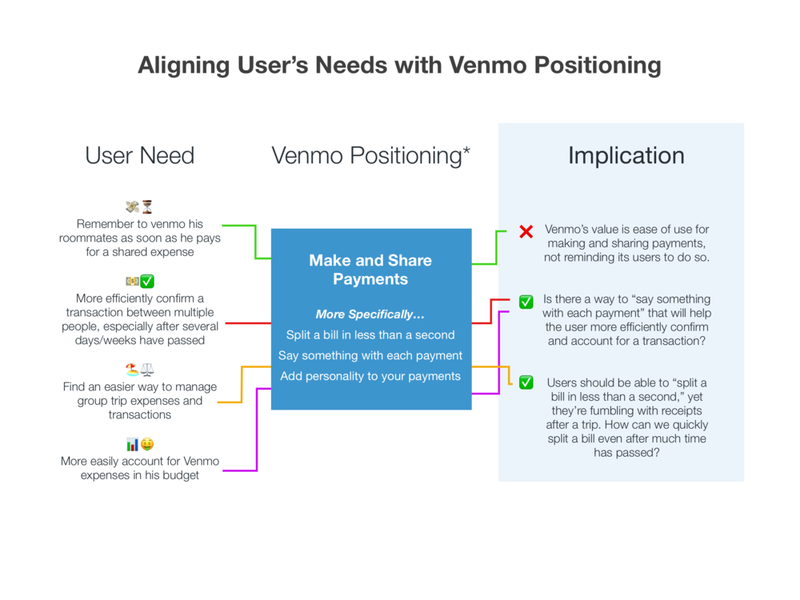 To synthesize solutions, I considered each alongside Venmo’s existing positioning and goals, which meant abandoning some solutions for the sake of brand continuity and ensuring solutions aligned with the company’s self-identified values about its product. While the two HMW's helped to generate dozens of solutions, it was clear that focusing on solving the problem of recognition over recall while confirming previous transactions (#1) was going to be more attainable given the time and resource constraints. Creating a group feature also meant integrating some of the smaller-scale solves as well to hopefully increase the overall feature's impact. 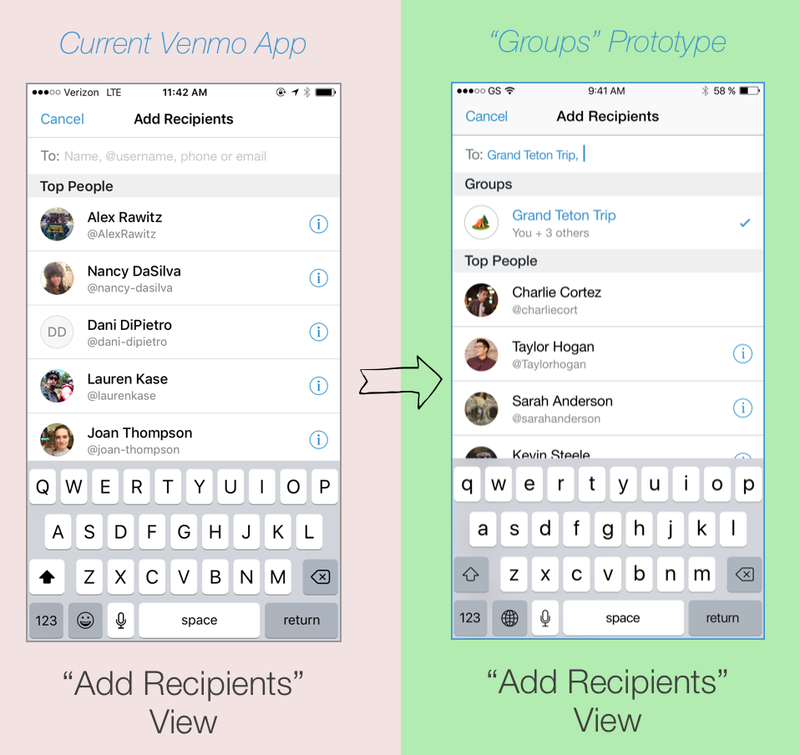 What will Venmo Groups Do? allow users to request or pay the Group by its name, much like they would a single friend, to quickly create a shared transaction. offer users quick recognition of Group transactions by their differentiating font color within their feed. ability to view an individual Group’s feed that will look similarly to the apps existing feeds, allowing them to quickly drill down to the transaction they’re looking for. In considering how this feature would integrate with the rest of the app, I developed several IxD artifacts to explore and understand possible user paths and entry points. Because Venmo's visual design is fairly simple and my time was limited, I made the decision to go from paper directly to high-fidelity prototype. Because of this, the interaction design had to be well thought-out before moving to Sketch. My focus was adding a new feature to an existing app, not reinventing or updating the existing app. To that end, I adopted all of Venmo's existing UI design principles and styles to create a prototype that demonstrated the functionality of the new feature while seamlessly integrating into the existing flow. 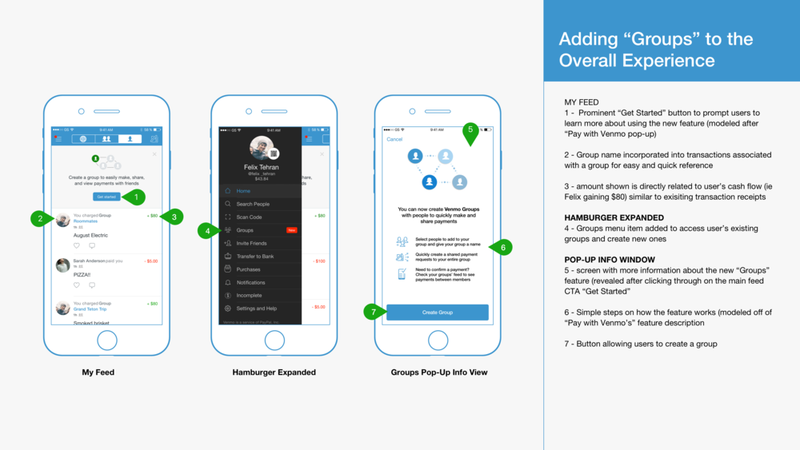 I re-designed existing frames that were part of the users "Groups" feature journey, such as the user's "My Feed," the hamburger menu, and the "Pay or Request screen" to demonstrate how the feature would fit into the overall app. There was of course additional screens that were brand new to the app as a result of this feature, so I designed those screens as true as possible to analogous screens, such as those in the "Pay with Venmo" experience. In order to validate my solution, I spent the afternoon at a coffee shop filled with millennials "working." 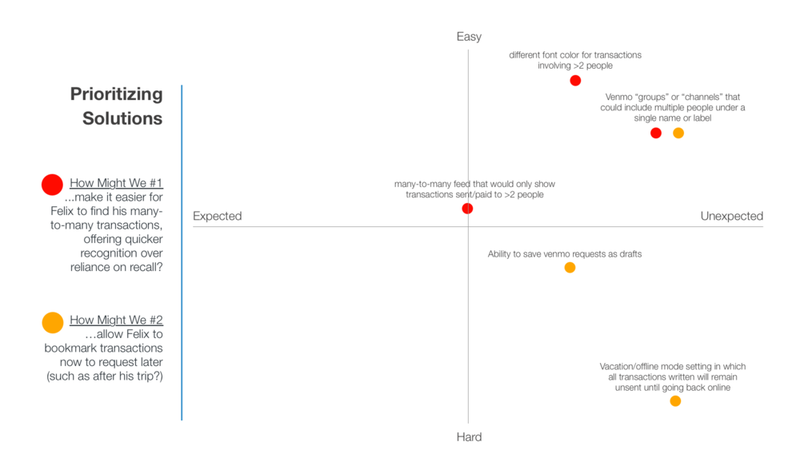 I conducted 7 in-person usability tests with the prototype on 2 specific tasks. Each task corresponded to the primary use cases of the groups feature and sought to assess how well the solution assisted with recognition over recall and how well it integrated with user's expectations of the overall app experience. Background on our user was provided to each tester to help contextualize the task and allow them to empathize with Felix. Testing revealed that overall, the feature was learnable and intuitive with everyone completing both tasks in under a few minutes. Users flew through the prototype with ease, and I often had to interject and ask them to "think out loud." Many users wondered aloud why this feature didn't already exist, remarking that it would be "great for x," or wishing they had it for situations ranging shared living expenses, a recent bachelor party, a trip they just took, etc. Overall, the feature successfully aided the users in their process of making and monitoring many-to-many transactions, creating an experience that offered quicker access to better organized information for when things with their finances get extra sticky (shared living expenses, big unruly vacations). Even though our user wishes he remembered to Venmo his roommates for bills on time or hates how confusing it is to track group trip expenses against his monthly budget, the reality is that he's doubtfully going to abandon those habits and will continue to "hack it" using Venmo. Feeling strongly against the adoption of other tools that are purported to help in these scenarios (Splitwise, for instance), our user will continue to use Venmo, even though the company's aim is fixed on monetization and continuing to be a tool for making and sharing payments (not necessarily reminding you to do so, or making sure you've always done so). Acknowledging all these truths from the research, I created a feature that could feasibly exist within Venmo's calm and casual tech approach, adopting a solution that fit within their existing UI while at the same time making it much easier for the user to accomplish the things he was already using Venmo for, but with many more headaches. Explore the feasibility of allowing for draft transactions within groups, to potentially mitigate the issue of saving all shared transactions until the end of a trip for the sake of seeming too much like a Scrooge or mood-deflator while on the trip, but solving the post-trip depressing frustration of settling up all at once and getting dozens of requests all at once. Focus on expanding "Pay with Venmo" capabilities to retailers frequently at the center of many-to-many transactions (for travel, retailers like Airbnb or Shell gas; for living expenses: cable companies, major regional and national grocers, and even municipal sewage and water boards).